(Nanowerk News) A research team led by Youtarou Takahashi from the RIKEN Center for Emergent Matter Science has demonstrated a novel phenomenon called magnetochiral dichroism, which prevents light from propagating parallel or antiparallel to the direction of magnetization ("Magnetochiral dichroism resonant with electromagnons in a helimagnet"). The discovery, which was made in the multiferroic ‘helimagnet’ gallium-doped copper iron oxide, could lead to new possibilities in the control of light at gigahertz and terahertz frequencies. Multiferroic materials exhibit both magnetic order and an electric polarization property called ferroelectricity. These properties are determined by the polarization of electron ‘spin’ in the multiferroic lattice. Scientists have recently taken a particular interest in multiferroics with spiral or helical spin structures, known as helimagnets. 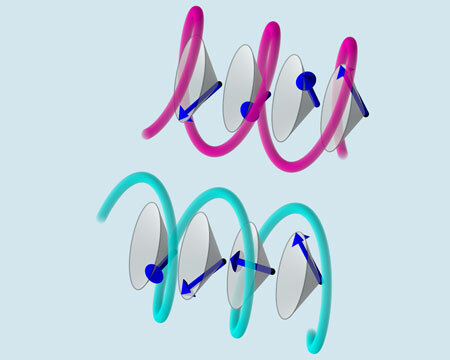 Theory predicts that the combination of spin helicity and magnetization in these materials could result in a novel form of magnetoelectric coupling called magnetochiral dichroism, in which helical or chiral electric and magnetic polarizations combine to form a dynamic electromagnetic field that can interact with light passing through the material. The multiferroic mixed oxide has a longitudinal helical or ‘conical screw’ spin structure due to competition between exchange interactions and geometric frustration among iron ions (Fig. 1). The conical screw spin structure provides the electronic chirality and magnetization that are required for magnetochiral dichroism. The inclusion of gallium in the material, a non-magnetic element, helps to stabilize the spin structure, which is needed to drive the novel optical phenomenon. The researchers examined the multiferroic material using terahertz spectroscopy and discovered that a reversal of electronic chirality or magnetization reversed the direction of magnetochiral dichroism. They also found that the propagation of light against the direction of the magnetochiral dichroism was severely inhibited, with a high absorbance or extinction coefficient at gigahertz and terahertz frequencies. The results suggest that multiferroic materials such as gallium-doped copper iron oxide could be used to control the propagation of electromagnetic waves in new ways, with implications for the development of isolators and optical devices that only permit the transmission of light in one direction. Takahashi believes that magnetochiral dichroism, which differs from other forms of directional dichroism such as magnetic circular dichroism, is likely to be a common property of multiferroic materials with conical screw spin structures and arises through collective optically active spin wave excitations known as electromagnon resonance.